If we think that with fencing the lake area to prevent further encroachment, planting trees and bushes and nurturing them, eliminating sewage, and getting more rain water into the lake, we have saved the lake, we’re in for a surprise. That is just the beginning! 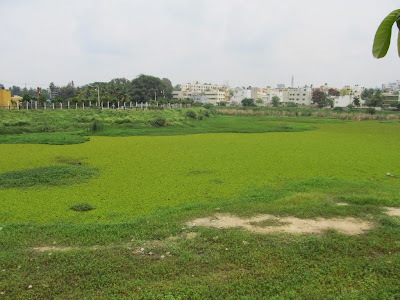 It was last August when a gentle green carpet started spreading itself over the dormant waters of Puttenahalli Lake. PNLIT trustees brought this to the notice of a few experts who said it could be a form of algae, and that the best way to get rid of it was to get more clean water into the lake. 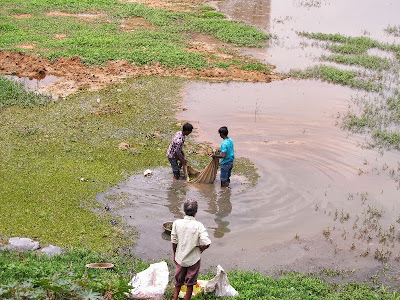 With a scanty monsoon last year, very little water entered the lake, and with rain water being the main source of water for the lake, there was little we could do. It was several weeks later, when one of the experts actually visited the lake, that the green carpet was identified as Salvinia molesta, an invasive aquatic weed that thrived in water, and was capable of doubling itself in a couple of days. No wonder that during the time since we noticed it, to the time we positively identified it, the surface of the lake was totally covered, barring a couple of patches. Most likely, the Salvinia got into the lake with the rain water. We knew that many of the fish under the water were still alive as on a few occasions we caught some boys with their fishing bounty. Reason enough for the purple heron and swamp hens to stick around, but many other birds that had made the lake their home quietly left. They were probably not getting enough food and we knew that they would come back when the situation was better for them. The fish and other water creatures did not have a place to go to, so the oxygen depletion caused by the Salvinia would affect them and they would be the ones to suffer. Till the time the Salvinia was removed, keeping some area of the surface free of Salvinia would help the oxygen level. Clearing out the Salvinia was the priority. Manual (mechanical) removal was the most obvious method. PNLIT trustees got in touch with several agencies and contractors. 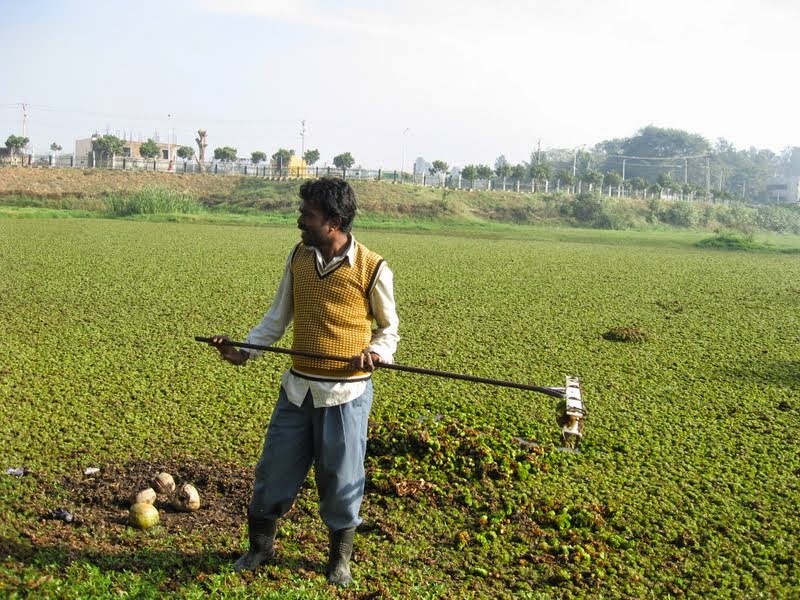 MEG (maintaining Ulsoor Lake) and the Fisheries Department said they were not in a position to help. Those contractors who visited the lake gave us quotations in the range of Rs 1.65 lakhs to Rs 4.50 lakhs for what they said would be 15-20 days of work for 25-30 workers. 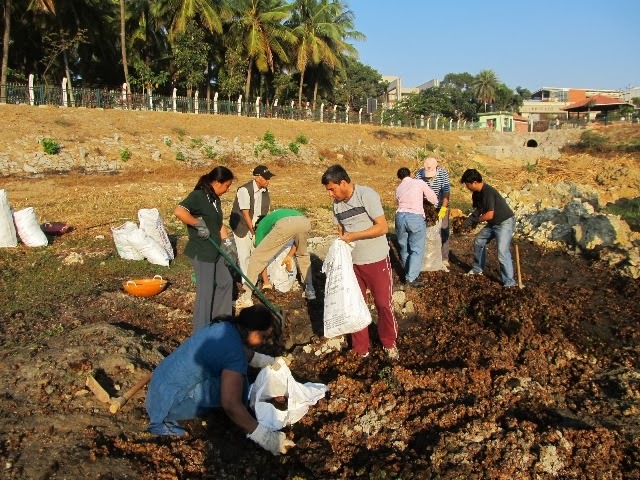 The Salvinia itself is easy to remove, as we experienced with volunteers. Its roots are only on the water’s surface, but one is limited by one’s reach. In very shallow waters, one would need to get into the water to reach it. Where there is sufficient depth of water, a coracle or boat would help. Labourers usually get into the water after sprinkling lime on the water to kill the water leeches and rubbing themselves with Honge oil to keep the live ones off. They use bamboo poles and nets to rope in the weeds. Then the weeds need to be moved from the water and marshy areas to a place where they can dry out. So deweeding, the way it is done, is very labour intensive, and as we found out, very expensive. 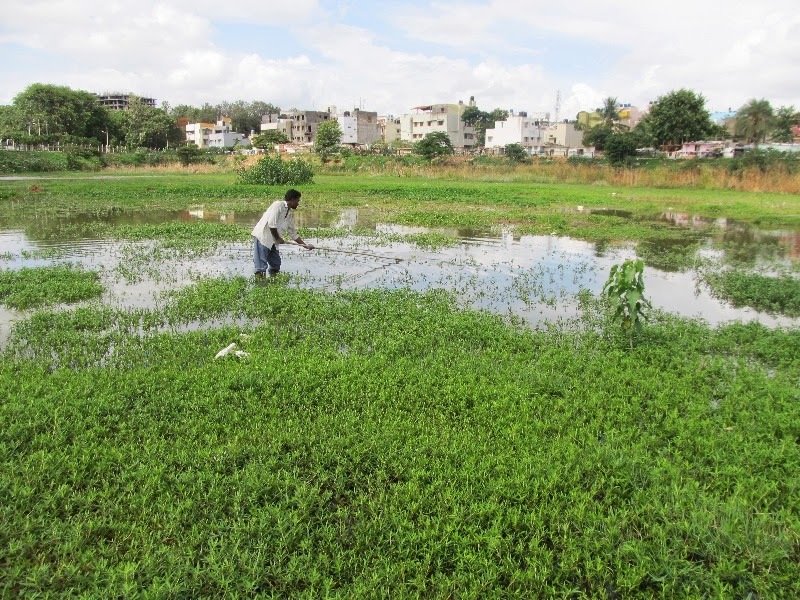 Prasanna and OPR visited Madiwala Lake to see how weeds were controlled there. Water hyacinth is the dominant weed here. The lake has a fishing contractor, who harvests the fish, and the responsibility of deweeding has been given to him. 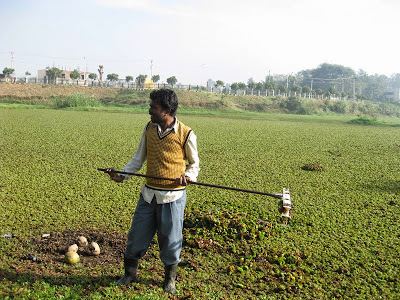 As he has an economic interest in the lake, deweeding is important for him, and as the lake is very large, deweeding needs to be done on a daily basis. His team spends each working day doing both fishing and deweeding. The labourers apply Honge oil and get into the water to push the weeds towards and onto the shore. Then a crane is used to scoop it up and pile it away from the water. Where it is deep, they take a boat right into the thicket of the weeds, and others on the shore pull the boat towards them using a rope. This brings the boat along with a big bunch of weeds. We were fortunate that the Salvinia infestation happened at a time when we still did not have a lake full of water. The lack of rain was a blessing in disguise. It gave us a chance to not panic in despair but instead research and experiment a bit also. Research on Salvinia and weed control indicated a few options of removal. Apart from the manual removal we had considered, there was chemical removal – using chemicals/ herbicides which we decided not to explore because of the possible effect on the water/ aquatic life. Biological treatment using the Salvinia weevil was another option which we kept in mind. Bruhat Bengaluru Mahanagara Palike (BBMP – which has the responsibility of large-scale deweeding at Puttenahalli Lake), in the meantime said it would undertake to do the deweeding along with another lake – in a couple of months. Being dependent on water, we knew that as summer approached, the Salvinia would dry out. So a couple of months would not be too bad. We realized that whichever method we used to remove the Salvinia, expecting total removal was impractical. We needed to have a proper regimen in place so that post removal, whenever the Salvinia was seen it could be attacked promptly. We decided to invest the money we would have spent on deweeding on proper equipment. In many countries (such as USA, UK, Australia), lake maintenance equipment is abundantly available, and this increases efficiency while reducing dependence on labour. We did a lot of online research and I had a few interactions with lake equipment dealers in the UK and USA, to get advice and ideas. On our request, Gautam Aggarwal, a well-wisher from London, bought and carried for us, a very useful rake called the Aspen Lake Rake, which can be used to reach far out from the shore. He also got us an inflatable boat that we haven’t had a chance to use yet. Kavita Arora, another well-wisher, arranged for a couple of pairs of hip-boots from London to reach us in Bangalore. We designed a few other floating aquatic rakes that we couldn’t buy online and got them fabricated. We also got approved life jackets from a supplier in Mumbai. All this equipment is proving to be useful at the lake. By the beginning of March, with the water level at its lowest, most of the Salvinia had turned from green to brown. Over a couple of weeks, PNLIT volunteers helped in clearing the lake bed. It was a massive effort and this spurred the BBMP to join the action. The marshy and more difficult areas were handled by the BBMP contractors and the JCB. While a lot of the Salvinia was moved out of the lake bed and composted, the volume was so huge that we had to find another option that ensured we handled this in the lake premises itself. As the monsoons were still a couple of months away, it was decided to dig a trench in the lake bed and bury the desiccated plants. After clearing out all the visible Salvinia, over the next few weeks in April and May, we were always on the look out for its reappearance. With the rains in May the birds started coming back! The Salvinia did reappear in small patches and we got it removed each time. After doing this a few times, Usha got in touch with Dr Ganga Visalakshy from the Indian Institute of Horticultural Research, Bangalore and Dr Lyla K. R., from the Biological Control Unit, KAU, Thrissur regarding the Salvinia weevil. After discussions with them, we decided to try the weevil to control the Salvinia. The weevil eats only Salvinia so other plants will remain unaffected. Our well-wisher Ramani Ramasubramaniam carried the weevils from Thrissur and they were released into two small infested areas in June. When the Salvinia turns yellow, it means the weevil is at work. Normally the weevil spreads over to different parts where Salvinia is present, provided there is no obstruction in its path. Subsequently, we got another lot of the weevils, released them into new infestations, and are now keeping the weevil in stock. 3-Jun-2013 Releasing the Salvinia weevil into a small infestation. While the Salvinia seems to be under control, we now have another “weedache”. The Alligator weed has always been present in the lake. During the summers, we’ve seen it dry out on the land, but being amphibious and very hardy, it has never died out. In recent weeks, with more water in the lake, it has been crawling all over the water. With the ability to grow from a small piece, the Alligator weed is sure to keep us on our feet! We are now exploring how best we can use the equipment we already have and establish an efficient way to keep it under control. We’ve also noticed what looks like green algae, supposedly caused by nutrients in the water, and are looking at tackling this too. Once there is more water in the lake, we can look at means to aerate the water (maybe through fountains). 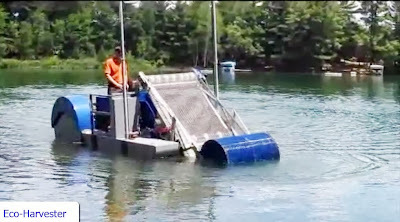 A pedal boat to monitor the lake (pedaling will result in aeration) would also help. Aeration would increase oxygen supply to the lake and discourage weeds. Also, as the trees grow, their shade would hinder weed growth. 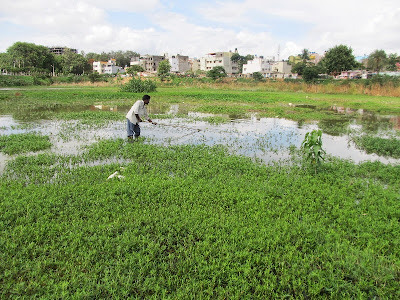 As more and more lakes are taken up for maintenance by citizens, we need to find an effective, efficient, yet economical way to handle water weeds. The BBMP/ BDA/ LDA have been using traditional labour intensive methods that require substantial budgets. It would be difficult for citizens’ groups to get labour and to support such investment. 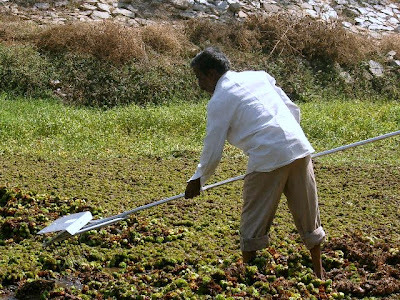 It may be worthwhile for the government agencies (or any private enterprising people) to invest in small water-weed management tools (that are not available in India but used extensively abroad) and larger weed harvesters/ pullers (either imported or Indian), that can be sold/ lent out to those managing lakes. With weed control set to be a major element of lake maintenance, a proper weed management agency (governmental or otherwise), that can help lake caretakers in devising strategies for effective weed control may become necessary. For those interested in knowing more about weed control, www.weedersdigest.com is an informative site. With the right tools and equipment, weed control could be as easy as pie! Hi I am looking for advise on cleaning of Hoodi Lake in Whitefield. under CSR our company has tried to hire labour contractor but not very professional. Need to know if some one can bring mechanical floating equipment at a reasonable rate so that hiring labour can be avoided and can be safe way of doing cleaning.